The Red Bull from the last unicorn, as voted by my patrons! "I said to the Red Bull I must have them, all of them, all there are. For nothing makes me happy but their shining and their grace. So the Red Bull caught them. 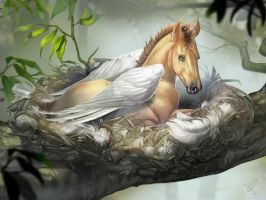 Each time I see the unicorns, my unicorns, it is like that morning in the woods and I am truly young, in spite of myself." That was such a sweet movie! If he doesn't give you wings, then demand $10 from him. I heard This movie might becomes a live action. that's awesome! The Last Unicorn has always been one of my favorite movies!! oh wow. I've never gotten goosebumps from a piece of art. thank you for this experience! So beautiful.. This is incredible. I haven't seen this movie in ages but you did a beautiful job with this art. This is one of my all time favorite movies. I have watched it many many times. This is truly a beautiful and wonderful tribute to this movie. Thank you for sharing this painting. rendering of a classic the last unicorn in a absolute beeft up style no pun intended. remarkable. can't what to see more of your work! This was my favorite movie growing up and still is to this day. I NEEEEEEEED a print of this, it's stunning! lol glad I could make that happen for you! Holy hell, amazing work on this! TLU was one of my favorite movies growing up, so this really speaks to me. The unicorn is wrong drawn due to the original but the red Bull is very stunning! 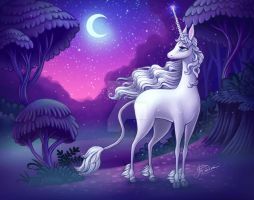 The Last Unicorn - Love this movie!!!! Now, if someone would just re-vamp the original to look like this we would finally have some serious competition for Disney!!! I wish I had that skill. *lifts hat* This is magnificent, almost as if the movie had grown up just like I did since I watched it for the first time. Oh my god. This is freaking gorgeous and breath taking. The nostalgia is absolutely overwhelming, I use to watch this movie all the time as a child.